Trying to show roller derby in the eyes of others as a sport goes much deeper than debunking what a skater wears or their derby name. In my next post on –> Derby Girls Blog <– I talk feminism stuff. But I’m not very eloquent on the subject so I recommend you also check out –> Fit and Feminist <– for more! Dear readers, I’ve been neglecting my blog and I am sorry. Lack of time and topics has been a hurdle. (Do you REALLY want to know how long and fast I skate when I work out? Five kms in 15 mins btw hahahaha) So now I am opening up the panel for questions. 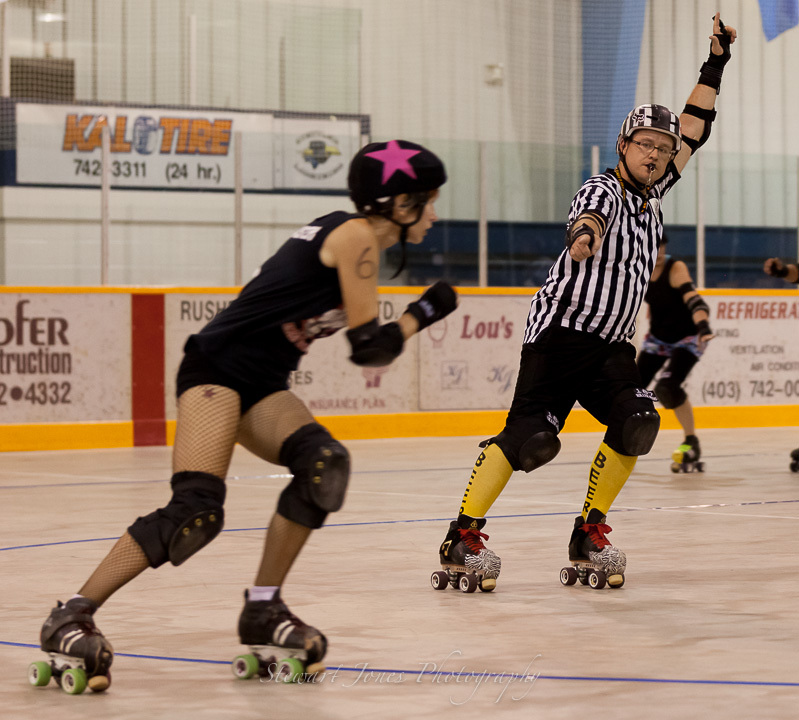 If you could ask a roller derby player any question, what would it be? You’ll be surprised to know the bone-crushing hits that you see on most derby highlight reels aren’t the only way to stop a player, so they don’t happen all the time. But when they do you’re (hopefully) wearing hi-end knee pads, elbow pads and wrist guards to keep your body safe from impact. Players are also taught to properly fall, to help stop injuries from impacting the floor. Players are also taught to properly hit, so you don’t dislocate your shoulder throwing a check. Plus during a game, your adrenaline is so high, you don’t feel a thing until about 3 hours later. When you’re not giving/receiving bone-crushing hits, you’re booty blocking opposing team members and leaning on other players, pushing them out of bounds to make room for your jammer. This makes for lots of velcro burn from rubbing against equipment which often hurts more than bruising! The rules of engagement are also there to keep players safe. There are legal hitting zones and you can only hit with certain parts of your body. Blockers can only hit within the area of the pack, jammers can engage each other at any time while rounding the track. But circumstances arise where the rules aren’t always obeyed, which often create the most crowd-pleasing jams. Believe it or not, no two girls can have a similar derby name, especially if they play in a city near each other. 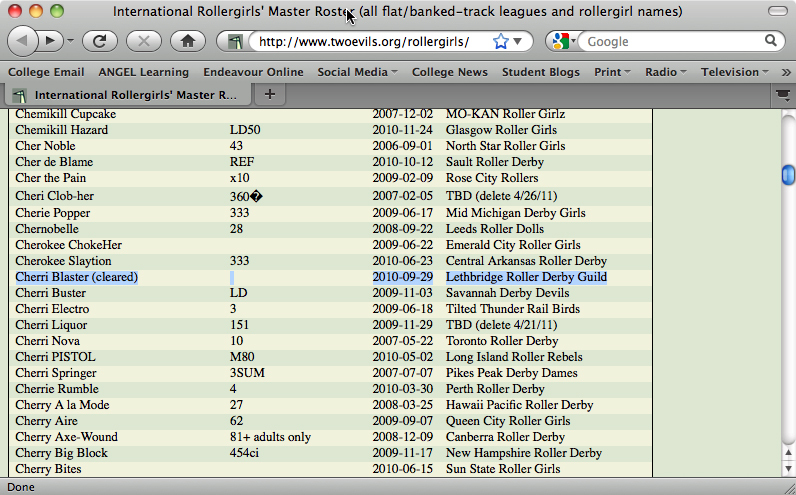 There is an International Rollergirls’ Master Roster to check if your name is already taken. In fact, my first choice, Barra Cougar, was too similar to another gal who plays for the Bad Reputations in Vancouver. I had to get in touch with her and ask permission if I could also use the name (hers was BaraCouga). But she declined my request, saying she worked hard to earn her name but encouraged me to keep trying. Cherri Blaster came about because of my love of that particular candy… practically lived on them in college. On the fun side of things, there is a roller derby name generator that helps you pick a name. But many girls look at their skills, their names or nicknames, favourite movies, their heritage, their jobs or their physical characteristics to pick a name. On the Deathbridge Derby Dames, for example, we have Half Pint Havoc who’s short, but wrecks havoc on all she meets, Lili Von Schtopp who is known for stopping all who meet her and Attila Themum, who’s a mom, plus so many more awesome names! Choosing a name also means figuring out your track persona, which is even more fun! I’ve seen some of the meanest looking, acting, named girls on the track, but off the track they are sweet as pie! You get to create a full package. Actually leopard isn’t really in my costume options. I try and leave the leopard print fashion decisions to Rebbles Flintstone and Nixxi Knox, who look way better in leopard anyway. As for the leg warmers, neon is usually worn best by Dream Whip, but I have a lovely pair of black-and-red striped leg warmers. I do, however, sport fishnets every so often, as well as derby socks. I also own a pair of tights with cherries on them. But my favourite by far is sporting bare legs. Skating fast tends to raise my body temperature pretty high, I don’t like to cover up too much. Plus I have a decent set of gams to show off! That’s all I have for questions right now. Thanks to the three of you who submitted! If anyone has any other questions, feel free to post them in a comment and I’ll answer them too! Derby love to you all!